Just a little topic chain that we can post neat news worthy items related to gravity, astronomic structures and planetary sciences. and since I'm starting this thread up I'll post the first 1's. Can we prove realms exist beyond our plane ... or ‘brane’? 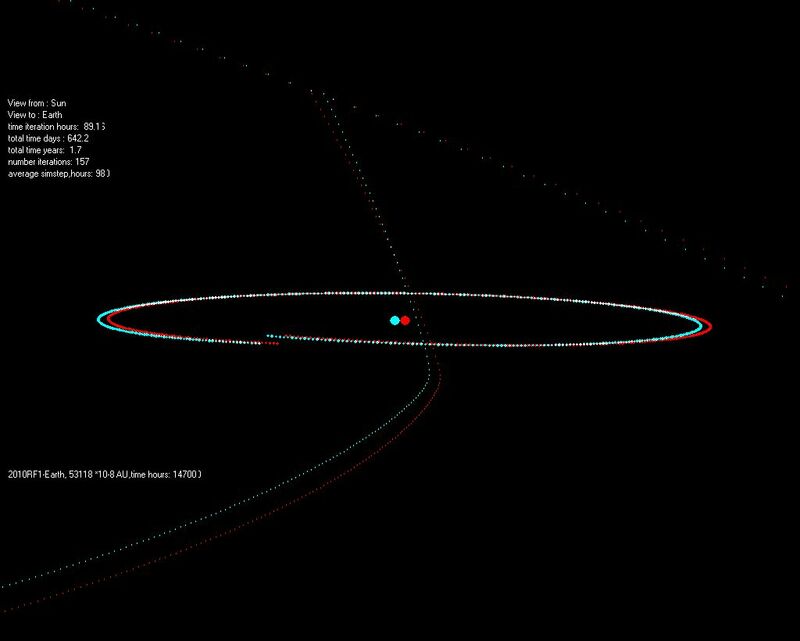 Neat article about the corkscrew asteroid . All your links are neat, and posting them here is a good way to keep a catalog of interesting links. As the article says, this asteroid is similar to 2002 AA29. There is a Gravity Simulator simulation on 2002 AA29. I forget if its part of the install package, but it is on the website's Simulations page. I'll make another simulation of the asteroid described in the article and post it here. The Universe's most fascinating and extreme sport. 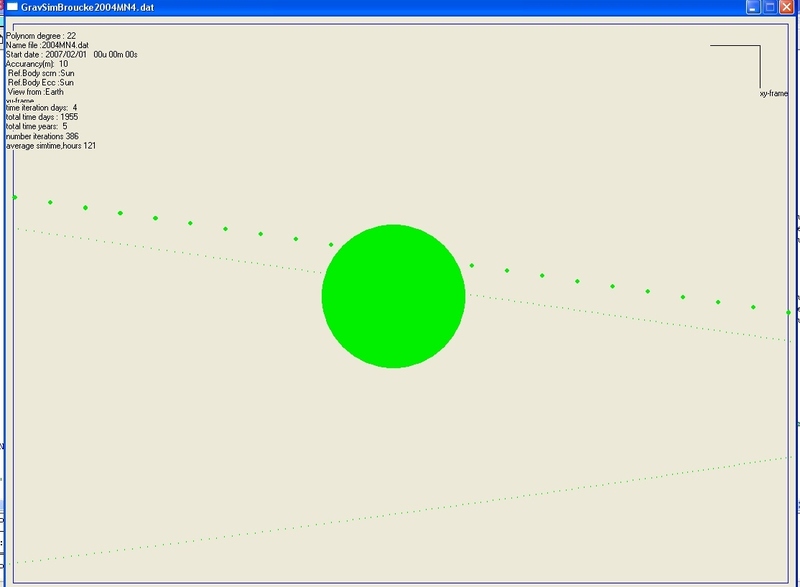 Here's a simulation for Gravity Simulator of Neptune's trojans. Starting conditions are courtesy of JPL. Other then that all space/planetary news is rather quiet. New way to find life on Mars? And we have another lull in news related to planetary and gravatic sciences. !!! Wahoo finally some news !!! Starting with a video and following up with 2 new articles. All members are invited to contribute to this thread. Know of some news we don't please share with us. We can hope on this one might give us a place to look. Keep Your Eyes open a definition is coming soon... We know that the final definition will be released between now and the end of September. The final drafts to go before the GA IAU will be determined from the Tuesday, August 22, 12:45 - 13:45 Plenary Discussion in the Congress Hall. On days with little astronomy/astrophysics news activity I will try to post at least a nice animation/movie link related to the subject each day. ??? First formal proposed definition of planet put forth at IAU GA ??? and don't let that stop us from having fun on the vote and debate threads on the subject. 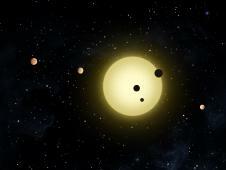 Image Gallery: The 12 "Planets"
Other astronomers have noted that it is possible there are three-object systems yet to be found in the outer solar system. If they are all round and have that certain barycenter thing happening, then they'd be called triple planets under the new definition. I could get a little stranger than that. 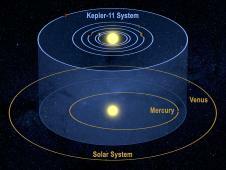 You could have a triple system where the smallest planet by itself is not strong enough to pull the barycenter above the surface of the primary. But the 2nd largest planet in the system is. So the smallest becomes a planet by default. This would be the case in the Pluto system if either Hydra or Nix were large enough to collapse into a sphere. I'd have used the high res one here but it might crash some peeps systems if the can handle the memory requirements for it, approx. 60MB. some may find this a little offensive please take it for what it is. since new on the planet debate issue will probably be scare I figured I could scramble something video related up. See The latest "DISSERTATIO CVM NVNCIO SIDEREO III" for more news on the planet issue or just read the article in the Planet definition discussion thread. Even in the linked paper, he does not mention the Kozai Mechanism as the cause. But his description of why these orbits are unstable describes the Kozai Mechanism quite nicely. I'd be mad if I were Professor Kozai. you know... I just read this article online... well.. I shoudl say I sketched through it. The graphic for it reminded me of Gravity Simulator. Indeed hard to simulate..must be a mix between fluid mechanics and gravitation . A couple of days ago I wondered how it is possible to simulate dark matter and the motion of planets in such a field . Suppose the solar system is filled with dark matter fi. the mass of 10 jupiters , but homogeneous . How would the planets behave , or do they already behave in such a way ? Live : lunar transit , from Belgium . hmm I wonder could photonic radiative pressure be one of the components of dark energy. seems weird and is promising . Not really news but some info for people outside the UK, which I gather covers the majority of members. We have a monthly TV programme called the sky at night which covers all things astronomical. Its been running for 50 years with the same (somewhat eccentric) presenter, Sir Patrick Moore. Anyway getting back to the point, you can watch all the episodes from December 2001 online courtesy of the BBC website. Some of the older ones are low quality but quite watchable. So for anyone who is interested here is the link. The shortest distance between two points is a straight line, or is it? Uranus and Neptune apparently could have switched places as their orbits evolved away from the sun? Here's the picture newly released from the Hubble space telescope . Have a nice Silvester ! Big Bangs by the Bajillion? Looks like they may have found something external to our space-time that exhibits a gravitational force within our space-time. Planetary formation: more than just gravitational instability? This paper, among other things, demonstrates that this model allows the formation of planets more quickly, and in less massive planetary disc, than the old models ( gravitational instability only ). The diversity of the phenomena of nature is so great,and the treasures hidden in the heavens so rich,precisely in order that the human mind shall never be lacking in fresh nourishment. Nice links. I know Dr. Joe Barranco, as I go to SFSU. He likes Gravity Simulator! REALLY interesting article about some gravitational switcheroos in the outer solar system leading to the Late Heavy Bombardment. (I've heard of this one before, but it seems to be gaining traction now!). Vitagliano managed to animate the Jupiter Trojans here . I'm wondering if it's possible to have the Trojans in a GravSim simulation . Would be great I think ! has been detected around Gliese 581 (Mayor et al). It is the lightest planet detected up to date around a main sequence star. bringing it in the habitable zone of the parent star. This can't be true ? 7 planets for this star ? Anxious to see the paper . Here's a screenshot for 3D glasses as seen from the sun. Fortunately it's in a free issue of the Astronomical Journal, so you can grab the PDF for free! I've only skimmed it so far, but the very interesting thing is that it says that there can be stable satellite orbits outside the planet's Hill Sphere, which I at least wasn't previously aware of. So check it out if you're interested! Venus has a (quasi-satellite) moon? Looks like we stumped Universe Today by over 3 years! The paper you linked to yesterday seems like it's considering quasi satellites as well when talking about satellites that are stable beyond 2 Hill Spheres. Nice! Seriously, I wonder why scientists don't seem to know about Gravity Simulator. I was reading an article yesterday about "curiosity-driven science" and how essential it is ( http://www.nature.com/news/2010/101117/full/468347a.html ), and it seems that everything we do on gravsim forums is definitely curiosity-driven - and look at the stuff we find! Yeah, I thought that a rather neat coincidence . Yeh , nice work ! When I read the old articles about the subject again I see also 2001CK32 (http://www.orbitsimulator.com/cgi-bin/yabb/YaBB.pl?num=1175113160/19#19) was suspected to show Trojan behaviour . I've just started a sim in rotating frame on Venus and yep ! it seems to be in a tadpole orbit nowadays around Venus . Will try to upload an animation later . Attn: Planet Hunters! There's a new "citizen science" site (like Galaxy Zoo and Moon Zoo) where you can go through Kepler stellar transit data and possibly find planets! Very cool Thanks I like the interface, Think I may have spotted a couple hot jupiters. Anyone want to model it? Possible water flowing on Mars ! Something to simulate with Gravsim ? Thanks for the link. Somewhere on this forum or perhaps on the BAUT forum I describe a method for using Gravity Simulator to compute how often Earth gets hit from asteroids. I exaggerate Earth's size to increase the likelyhood of a collision, then adjust my figure accordingly. The same method might be useful for anyone wanting to simulate the experiments in this paper. Sorry, I missed this post while out of town over the Summer. Here's a sim of this asteriod. One of the stalwart units of astronomy just got a makeover. The International Astronomical Union, the authority on astronomical constants, has voted unanimously to redefine the astronomical unit, the conventional unit of length based on the distance between the Earth and the sun. Under the new definition, the astronomical unit (or AU) — the measurement used for the Earth-sun distance — is no longer always in flux, depending on the length of a day and other changing factors. It is now a fixed number: 149,597,870,700 meters, which is the equivalent of almost 92.956 million miles. We must have missed this news : first uranian trojan discovered . Also : some new neptunian trojans discovered in L5 ,adds up the number to 3 in L5. Thanks for the link! Interesting blog. You're on APOD today ! Nice catch! How did you happen to find that? Surface features and a polar cap. Strange it would have a polar cap since its pole is pointing in the general direction of the Sun.